One year, two people and a little RV. This will be the ongoing account of our journey to discover some of North America's most appealing places, people and things. Beginning from the Pacific NW, we will travel to where ever our imaginations invite and our noses may lead us. If you have some special places to suggest, please do! Bishop is a great little town, all the stuff you need to get back into the forest and then some. Lots of bakeries, delis, and sporting goods stores. They have a beautiful city park where we spent some time, a good starting point for most places we needed to go. A few miles away is a great museum called Laws Railroad Museum. They have a big steam locomotive, other RR cars, a depot and two long rows of old little buildings for the little "town". They have a very active crew of volunteers who work many hours rebuilding and refurbishing old railroad cars, mining equipment, and many kinds of machinery. We arrived on a day when a couple of busloads of 4th graders were visiting so we had the bonus of many volunteers sharing their knowledge about the exhibits. Not far from Bishop, in the foothills of the Sierras is a unique area called Buttermilk Country. It is similar to the Alabama Hills in that it is a world class boulder climbing and scrambling area. We spent two nights here, taking long walks, scrambling around and watching the real climbers on the boulders presenting interesting problems. The nights were lovely, bright stars, cool temperatures and the dramatic backdrop of the soaring mountains to the west. We even saw a few snow flurries but they were very short lived. We hiked to where the river plunges through a steep bouldery canyon, very scenic. Feeling pretty grungy, we headed into Hot Springs country. We stayed 2 nights at what we think is Crab Pot Hot Springs. Though not large pools, they are big enough for the 4-5 people that might show up. The water is heated underground by the hot magma that still exists after thousands of years of volcanic activity in this area. The ground is covered with pumice and small chunks of obsidian from the many explosive eruptions in the past. Talking to other folks, we learned about other springs in the area and ended up coming back to one called Sheepherder HS, also a beautiful pool overlooking a small lake. It felt really great to get cleaned up! Another short detour was to Hot Creek Geological site, with geysers and springs too hot for soaking and looking very much like Yellowstone. If we could only fit all this into our backyard! Next up was Convict Lake, a pretty alpine lake carved by glaciers out of the ancient stone of the Sierras. There is a resort on one end of the lake and a nice trail going all the way around. We stayed one night most of two days so I was able to get in 2 laps around and then some. The path leading up to the pass was a bit too much but I did part of it. There was a nice beach and lots of sun for lazing around reading books and feeding chipmunks. The lake is surrounded by glacial moraines, one of the best examples of a glacier carved lake that I have seen. The lake is a fantastic shade of blue green. A typically colorful history involving escaped convicts, posse chases, murder and mayhem gave the lake it's name. Yes, still cold at night around here! Mammoth Lakes is a ski town, still open though I could not see where they could be skiing, just didn't look like enough snow to me. I took a longer hike to Sherman Lakes than necessary since I missed the second lake and walked way past my destination. Is it possible to get blase about continuously scenic beauty? I have so many pictures of towering, snow topped mountains, stunning trees and rocks, gorgeous lakes and sights that I've almost stopped taking pictures! We made a quick stop at Obsidian Dome, a large outpouring of glassy volcanic material, a source for the Native Americans. June Lakes Scenic loop is a short detour off of Hwy. 395, there are many resort and camping opportunities, some lakes and streams and cute little shops. We drove through all of that and ended up at Parker Lake, another dazzling alpine lake.... We spent two nights downstream on the creek, enjoying the sound of water rushing by and choruses of birds in the morning. The bugs started eating us however, so we moved along, counting the days til we have to actually be home. Mono(MO-NO, not Ma-NO) Lake is a fascinating place, geologically, biologically, and historically. The lakebed is the remnant of a colossal volcanic eruption, certainly on the scale of the Yellowstone Supervolcano. it is riddled and surrounded by cinder cones, old craters and volcanic debris. We visited Punar Crater, a textbook example of a rhyolitic volcano. It had a huge initial explosion, then collapsed, sinking a mile into the ground. It then went through a period of cone building extruding loads of obsidian and glassy pumice. It is one of many craters in a chain stretching to the south of Mono Lake. Right on the edge of the lake are the Tufa formations, tall, intricate towers of limestone created by springs that used to be under the lake surface. As the lake level dropped the springs disappeared and the formations left behind are left to the forces of erosion. It was kind of like being outside in a cave, if that makes sense. A short distance away is Navy Beach, where there is another kind of tufa, called sand tufa. They are produced similarly to the other area but are much more delicate, constructed of thin walls of sand. They look like fantastic sand castles or Star Wars cities eroding into the sand. The Mono Lake area has a very interesting history. The Paiute Indians lived prosperously and gently in this difficult environment for thousands of years, they were called the "fly eaters," because they ate the pupae of the tiny flies that line the shores. The ecology of the lake is like no other on earth. 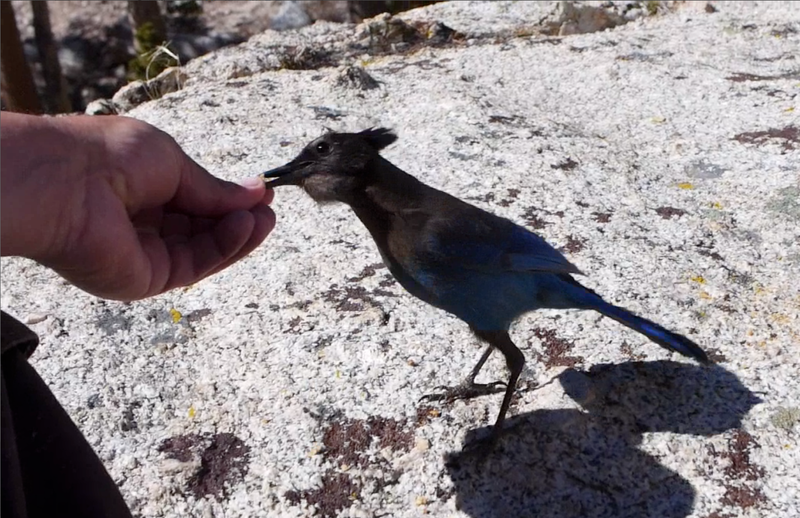 Millions of birds use Mono Lake as a resting and feeding site on their migrations. There was a delicate balance in the populations of brine shrimp, brine flies and birds. In the 1930's the city of Los Angeles came along and secretly bought up all of the water rights in this great valley, called Long Valley. They started diverting the water to their aquaducts and sucking it dry, putting most of the farmers and ranchers out of business, and devastating the ecology of the watershed. The level of Mono Lake dropped precipitiously as the sources of it's water were diverted to the city. Creeks that used to flow to the lake dried up, killing the trees and plant life that fed the lake. Since the lake has no outlet, similar to the Great Salt Lake, the salinity increased, changing the whole food chain of the lake and severely impacting populations of insects, brine shrimp, and birds. A staggering 80% of California's seagulls make their nests on an island of Mono Lake. As the lake level dropped the island was no longer an island, and predators were able to get to the nests and devour the eggs. By the 1960's the ecosystem was on the verge of collapse. About that time, a small group of dedicated people began to fight back, working to restore historic levels of the lake, improve creek habitat and rebuild a devastated ecosystem. It wasn't until 1994 that the state of California decreed that LA had to limit the amount of water they were taking and begin to raise the level of the lake. Drought in current years has made this very difficult but they are slowly making some progress. There is an excellent visitor center in Lee Vining that relates the whole story and highlights the efforts of the individuals who made it happen. One that stuck in my head is the story of a LA Mother's group who spearheaded water conservation efforts in LA, providing low flush toilets to anyone who would install them. Because of this and many other efforts, LA has become a world leader in water conservation. There are massive educational programs for youth, trying to drive home the point that water is not free, it has to come from somewhere. Kids learn about the communities that are affected by their water usage and ways that they can protect this precious natural resource. Mono Lake is now one of the most studied places on the planet. Lee Vining was our turning point to the west, we are on to Yosemite and the coast, the final push for home. Hey now, this is a great place! Blue skies, warm temps, balmy breezes and fantastic scenery! Yes, we do feel a little guilty hearing about our soggy friends & family back in the Pacific NW, but we're coping with that as best we can. Over the past week we have visited several notable places, the first being Rainbow Basin, a BLM site north of Barstow. It is a crazy geologic site, eroded out of some vast sink hole, and I never did quite get the whole story of how it was created. There are layers of colorful rock going in every direction with an exciting (but not too exciting) wash-boardy, dusty, narrow loop road going through it that has been carved into the terrain. I like excitement, don't misunderstand, but I also want to feel we won't be stuck out in the middle of no-where. Manageable, controllable excitement is best, I think. Anyway, we spent a night at a scenic lookout, hiked around the next day and then drove on. And looming in the distance were the southernmost Sierra Nevadas, startling in their height and beauty. Some of you old-timers, or folks who enjoy old B-westerns, would easily recognize this area. The main road going through it is called Movie Road, named for all the movies that were shot there back in the early days of action westerns. Thayer was sure he saw the exact spot where the Lone Ranger leaped off the rock onto the back of the bad guy as he galloped by on his horse. If the City of Rocks was great, this area is even larger and better. The Alabama Hills are comprised of BLM land and designated for dispersed camping with sites are far apart and tucked in amongst the rocks. BLM usually equates to free with little-to-no amenities. That's fine with us! We stayed for five nights, taking long walks, reading books, painting and sketching, taking pictures, and scrambling over and under the countless boulders and rock outcroppings. It did get hot during the few midday hours but the sun drops pretty quickly behind the wall of mountains and everything cools down to a perfectly nice temperature. One hot day we drove the steep, winding 10 miles up the Whitney Portal road which leads to the trailheads for Mount Whitney, the tallest mountain in the lower 48 states at 14,510 feet. We hiked up a few thousand feet to still frozen Lone Pine Lake, passing through forests of BIG trees with many varieties, including some that I was unfamiliar with. After all our recent time in the desert it was really nice to get up into the cool trees and streams. This felt more like home and was a refreshing break from the hot & dry. We were stopped by snow above 10,000 feet but didn't really mind as we were plenty tired enough by then. Stopping on a sunny rock for lunch, we enjoyed the magnificent view and impromptu dinner show entertainment by the Stellar Jays hitting us up for a share of the grub. Then down the trail, down the scary road, and back to our little campsite next to Fred and Wilma's stone cave. We loved our stay in the Alabama Hills! A few miles farther along our journey we came to another must see site, the Manzanar War Relocation Center. Manzanar is one of ten internment centers created immediately after the bombing of Pearl Harbor in 1941. With racial phobia growing in the US, the defined purpose was to inter, control and "watch" the Japanese Americans living in the west coast states. 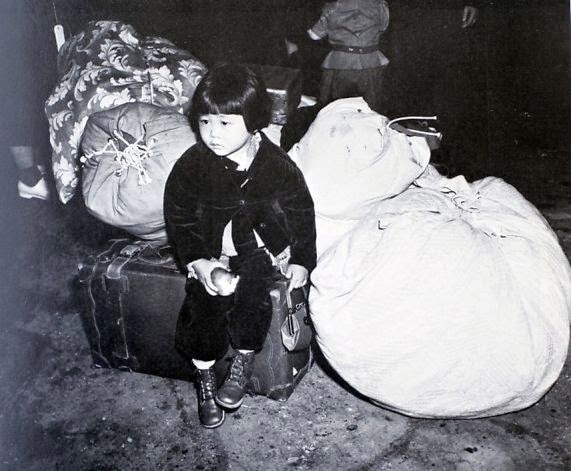 These citizens and whole families were unceremoniously uprooted from their homes and lives only because they were deemed a potential threat to the war effort. Even though 2/3 of them were American citizens by birth, the government worried that they might retain some loyalty to the Japanese emperor. The other 1/3 of the prisoners were immigrants (mostly elders) from Japan who had been denied citizenship solely because they were Japanese!! Thus, 120,000 Japanese Americans, infants to elderly, were interred for 2-3 years, from 1942-1945, with about 10,000 of them at Manzanar. It is a fascinating and sad chapter in American History, and only until recently (the Reagan Administration) did the US admit that an injustice was committed. With current events as they are it is even more sad that we seem doomed to repeat this horrible discrimination of imprisoning our people without due process. Lest we forget the tragedy, there are regular pilgrimages to the site by survivors and their families. Today the Manzanar site is mostly a ruin, though they have reconstructed several barracks and a mess hall for visitors. The visitor's center is very well done, presenting the concepts and events fairly and truthfully (I felt) but mostly focusing on the lives and experiences of the inmates. Moving along to the north, our next couple of nights were spent at lovely, green Dehy Park in Independence. A pretty little stream flowed through the trees and we found quiet, private parking. We spent the afternoon in the East California Museum, enjoying the best Native American basket exhibit that I have ever seen. The designs and workmanship of the artisans were outstanding. They also had loads of arrowheads, worked points and tools, and one ceremonial point was about 14 inches long! Being a fan of Edward Curtis, I was excited to see about 20 beautifully framed prints of Native Americans. They were just stunning! Several months ago I read (and would recommend) a biography about him, a great book called The Short Nights of the Shadow Catcher. We owe much of what we know about the tribes from the early 1900's to Edward Curtis. Outside the museum was the nicest collection of old wagons and rusty stuff that I've seen in a long time, most of it farm and mining equipment. The native plant garden was blooming like crazy and the scents were almost overwhelming. The path between the park and the museum went out into the sage, and I so wished I could take "pictures" or somehow capture the aromas wafting through the sage and lupines to share and remember. In the park we enjoyed sitting in the shade of the big trees with our feet in the water, watching yet another day draw to a close as the breeze wrapped its warm arms around us and fingers through our hair. until you've had it so good! You can bet I'll be recalling this day when I find myself back in a classroom next year! Ever northward we traveled, next taking in the surprisingly impressive and beautiful Fish Hatchery just north of Independence. Who would expect a large 3-story stone Tudor building, looking more like an old European monastery, to be California's first and greatest fish hatchery? It is a lovely building, situated on Oak Creek, and has a large pond loaded with the state fish, the golden trout. Unfortunately, there was a forest fire in 2007 which preceded a terrible flood in 2008, damaging the ponds and tanks badly enough that the state abandoned the site. Fortunately, there was a volunteer group already involved with the facility and they have taken it over and preserved the historic building and grounds. They raise a few fish for seeding, provide educational programs for area schools, tend the grounds and pond and keep it open for public visitations year round. It would be grand to see it returned as a fully functioning fish hatchery again. I can't fathom how bad the damage from the flooding was but it seems like there is so much already invested in the hatchery that they/we/you would want to keep it going. Before heading on into Bishop for resupplying, we made one more stop. Keogh Hot Springs was right off the road and Thayer had memories of stopping there during one of his flying trips in this area. And goodness knows we can always use a bit of cleaning up! There is a little resort area with cement pools, camping, and "developed" stuff but we opted for the natural pools downriver. There are a series of semi-private pools that wind through the sage, rocks and grasses. They are a very pleasant temperature, nice even on a hot day. There were very few people and plenty of pools – a good ratio. One young family with children had the nicest pool. It had waterfalls, boulders and deep holes that the children were clearly enjoying. We also tried panning for gold in the gravel, using plastic cups, but had no luck. There were lots of little sparkles but they were pretty lightweight. We will now be heading deeper into the Sierra Nevadas, then going up and over Yosemite National Park and on to the coastal areas. We have only about four more weeks before ending up in Seattle....Nooooooo! It can't end!! !